This brief explores the self-reported health of residents living in neighborhoods served by the first five Choice Neighborhoods implementation grantees. We examine health of residents living in the five target developments and residents living within the five Choice boundaries (“surrounding neighborhood”) during the baseline survey. It lays the groundwork for understanding how redevelopment may affect the health of target development residents. We find residents of the public housing developments tend to report worse health conditions than residents of project-based Section 8 developments. The Choice Neighborhoods Initiative (Choice) funds the replacement of poor-quality assisted housing with new mixed-income developments that promote energy efficiency and safety, and strive to contain the appropriate number of units for families of various sizes and ages. The potential effects of Choice’s redevelopment on families and neighborhoods extend beyond safe and decent units. High-quality housing also supports and complements broader neighborhood improvements, as well as facilitates interaction and community building within a mixed-income development. Research shows housing affects health. Poor physical quality—lead paint, mold, leaky roofs—and inadequate space or amenities can impede normal child development and place stress on the entire family (Etzel and Rylander 1999; Solari and Mare 2012). Housing’s ability to affect health is why housing redevelopment is commonly framed as a health intervention (Braveman et al. 2011, Maqbool, Viveiros, and Ault 2015). In the context of Choice, housing interventions are paired with other services to improve health. Evidence from Choice’s predecessor, the HOPE VI initiative, shows residents living in public and assisted housing tend to have multiple and severe health problems. Intensive supportive services are necessary to ensure residents’ well-being during the period of temporary relocation while new units are being constructed (Popkin et al. 2002). What’s more, research on HOPE VI found that after relocation, improved unit quality had no effect on health (Manjarrez, Popkin, and Guernsey 2007; Price and Popkin 2010). These findings mean that improvements to housing alone are unlikely to improve the physical and mental health of residents in distressed public and mixed-income housing (Popkin and Getsinger 2010; Popkin, Levy, and Buron 2009). Although quality housing can help prevent the development of certain conditions, the severity of health problems among public and assisted-housing residents requires comprehensive treatment. The range and depth of health problems from the Choice Neighborhoods baseline survey indicate that a comprehensive intervention—supportive services during and after relocation, improved housing units, a built environment that promotes health and walkability, increased public safety and improved health amenities—will be necessary to improve the health of residents who have serious, chronic health problems (Hailey and Saxena 2013; Popkin and Davies 2013; Popkin and Getsinger 2010). Quality housing is an important component of, but not a substitute for, a comprehensive and intensive strategy for improving health. Choice has clear health goals designed to improve both physical and mental health for residents of the target development. Health interventions among the first five Choice Neighborhoods implementation grantees focus largely on better connecting residents to mental and physical health resources: opening community based clinics, ensuring residents are enrolled in health insurance that complies with the Affordable Care Act, and connecting seniors to nutritious food delivery programs. This brief explores the self-reported health of residents living in neighborhoods served by the first five Choice Neighborhoods implementation grantees. We examine health of residents living in the five target developments and residents living within the five Choice boundaries (“surrounding neighborhood”) during the baseline survey, which took place between July 2013 and May 2014. It lays the groundwork for understanding how redevelopment may affect the health of target development residents. For background on the Choice Neighborhoods project and descriptions of the neighborhoods and target development in each city, please see appendix A. The survey shows residents face significant physical and mental health challenges in the Choice Neighborhoods. Health problems are particularly acute for residents in public housing target developments. These findings indicate that to be effective, case management and supportive services before and after redevelopment must acknowledge the severity of health problems. The sites must tailor their interventions to meet the particular health conditions of residents of various ages and needs. For working-age adults, health problems are significant barriers to employment; for children and older adults, health problems are a serious risk to long-term well-being. To meet these challenges, Choice Neighborhoods grantees should leverage their HUD investments to secure additional resources from other local, state, and federal agencies and partners. Also in the three Choice Neighborhoods centered on public housing developments, target development residents rate their overall health significantly lower than do residents of the surrounding neighborhoods. The same is not true for residents of the two Section 8 target developments. Across Choice Neighborhoods, residents of the target developments are at least as likely to rate their health as fair or poor as the national average of black women living in poverty (32.7 percent), who, as a group, already have higher rates of health problems than men or women of other races.2 Residents of surrounding neighborhoods tend to rate their health better than the national comparison, but the surrounding neighborhoods in Boston, San Francisco, and Seattle are significantly more diverse than the surrounding neighborhoods in Chicago and New Orleans, which are predominantly black. Although health problems are high for target development residents of all ages, relative to national averages, they are particularly severe for respondents age 62 or older in the three public housing sites: in New Orleans, San Francisco, and Seattle, over 43 percent of elderly residents rate their health as fair or poor. Elderly residents in the Yesler Terrace (Seattle) are the most likely to rate their health as fair or poor (77 percent). Residents of both the target developments and their surrounding neighborhoods report high rates of chronic health problems. Although Grove Parc (Chicago) residents report better overall health than residents of the three public housing sites (figure 1), as figure 2 shows, Grove Parc residents report similar incidence of chronic health problems (41 percent) to the three public housing sites (43 to 51 percent). Rates of chronic illness among target development respondents in the three public housing sites and Chicago are comparable to or higher than the rate in the HOPE VI Panel Study (39 percent). The survey data suggest that neither low rates of health insurance coverage nor lack of access to medical facilities is a significant problem in the five Choice Neighborhoods. The self-reported health insurance coverage rates (including directly purchased plans, as well as insurance through employment, Medicare, and Medicaid) vary by Choice Neighborhood, but are generally at or above the national average of 86 percent (Smith and Medalia 2013). Likewise, in all sites but New Orleans, 75 to 85 percent of Choice Neighborhoods residents say they have a place they go to when they are sick or need advice about health. The New Orleans rate is lower than the other sites, at 68 percent, but this figure is not statistically significant. If, according to the self-reported survey, lack of access to medical services is not a significant concern, it is likely that other factors are the primary drivers of the health problems Choice Neighborhoods residents report .These factors may include chronic violence, environmental toxins, and other neighborhood-level risk factors (Ellen and Turner 1997; Robert Wood Johnson 2008; Sampson, Morenoff, and Gannon-Rowley 2002; Wodtke, Harding, and Elwert 2011). High levels of crime and neighborhood violence are particularly associated with mental health disorders such as anxiety and depression resulting from chronic stress and trauma (Brooks-Gunn and Duncan, 1997; Hooven et al. 2012; Popkin and McDaniel 2013). During the Choice Neighborhoods Initiative’s application and early implementation period, all five Choice Neighborhoods had crime rates exceeding twice that of their associated cities, and survey respondents often perceived safety as a problem at night (Pendall et al. 2015b). Figure 3 shows residents from both the target developments and surrounding neighborhoods report high rates of poor mental health, according to the five-item Mental Health Inventory scale.4 Residents of the target development report significantly higher rates of poor mental health than residents of the surrounding neighborhood in three of the five Choice Neighborhoods. Over 45 percent of residents of the target developments in the public housing Choice Neighborhoods (New Orleans, San Francisco, and Seattle) report poor mental health. The higher rates of poor mental health among residents living in public housing are another indicator of elevated distress in the public housing Choice Neighborhoods compared to the project-based Section 8 developments. Choice Neighborhoods residents’ mental and physical health problems are debilitating. Health issues are significant barriers to employment and training for working-age adults (18–62) living in both target developments and surrounding neighborhoods. Employment rates among working-age residents of target developments range from a low of 36 percent in San Francisco’s Alice Griffith to a high of 50 percent in Seattle’s Yesler Terrace (appendix A). As figure 4 shows, more than 40 percent of unemployed working-age respondents in the three public housing communities say they were not working because they have a short- or long-term disability, reflecting the severity of health problems in this population (Popkin and Getsinger 2010; Popkin et al. 2010). The Choice Neighborhoods baseline survey asked parents to report on the health of their children ages 6 to 14. Not surprisingly, the overwhelming majority (often exceeding 90 percent) of parents across the target development and neighborhood samples report that children were in good or excellent health. However, there are signs that the children, like their parents, had high rates of health problems. According to parents’ reports, health professionals have diagnosed 10 to 20 percent of children across sites and samples with a limiting physical, learning, mental, or chronic health condition.5 More alarming are the high rates of childhood asthma that, in some Choice Neighborhoods, are over twice the national average.6 Figure 5 shows children living in the Woodledge/Morrant Bay target development in Boston have the highest asthma rates at 41 percent. Rates of asthma for target development residents in the three public housing communities are comparable to rates from other surveys of children living in public housing (Jordan, Mireles, and Popkin 2013; Popkin et al. 2002; Scott et al. 2013).7 High rates of asthma are of particularly concern during childhood, increasing the probability that children miss school and become chronically absent (Moonie et al. 2006). One potential source of the high asthma rates among Choice Neighborhoods children is poor housing. Although the baseline survey does not indicate a correlation between the families’ housing conditions and child asthma, a large body of research shows poor housing quality, such as leaking roofs, mold, and pest infestation, can cause asthma and other respiratory illnesses among adults and children (Hood 2005; Rauh, Landrigan, and Claudio 2008; Takaro et al. 2011). Before redevelopment, target development units (“original units”) were severely distressed, with the average number of reported housing condition problems ranging from 2.1 to 3.4.8 Mold, pest and vermin infestations, and water leaks were among the most commonly reported problems across target developments. Yet the survey suggests that housing conditions are significantly improving for target development residents in relocation or, in one Choice Neighborhood, living in new redeveloped units. Figure 6 shows that residents in Woodledge/Morrant Bay (Boston), Grove Parc (Chicago), and Yesler Terrace (Seattle), living in their original predevelopment units, report significantly worse housing conditions than residents no longer in the target development (those either in temporary relocation or with a housing choice voucher). In Chicago’s Grove Parc, residents living in redeveloped units report less than 1 housing problem on average, significantly lower than the number of housing condition problems that residents report in pre-redevelopment units. This early evidence from Chicago suggests the quality of housing has significantly improved under Choice. Adult residents of Choice Neighborhoods report poor mental and physical health. Their health problems are likely to be debilitating and significant barriers to employment. Target development residents of the Choice public housing sites are particularly likely to have poor health, a finding consistent with previous research on residents of public housing. What’s more, the children in some Choice Neighborhoods are exhibiting early signs of health problems, notably high levels of asthma. For these residents, strong case management, supportive services, and other health interventions are critical before and during relocation to help mitigate the stresses of moving and to ensure healthy relocation. 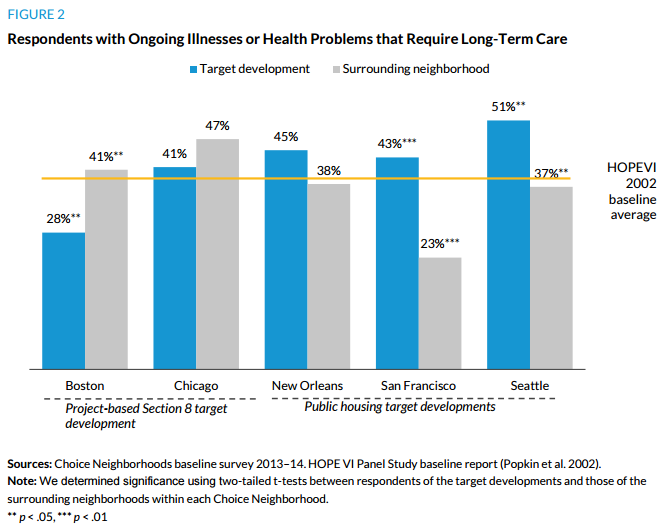 Yet supportive services during relocation and improved housing unit quality after redevelopment are unlikely to address the chronic health conditions among target development residents. In addition to sustained health services and case management after redevelopment, improved neighborhood walkability and public safety, investments in neighborhood amenities, and other health resources will be necessary for addressing long-term, chronic health problems and providing opportunities to address children’s health. This type of comprehensive intervention—in health, neighborhood amenities, public safety, and housing—is necessary to improve the health of Choice residents. Such an intervention will likely require Choice Neighborhoods grantees to leverage their HUD funding to secure additional resources from various other federal as well as local and state partners and agencies. The US Department of Housing and Urban Development’s Choice Neighborhoods Initiative (Choice) aims to transform distressed, high-poverty neighborhoods into revitalized mixed-income neighborhoods by rebuilding distressed public and assisted housing into energy-efficient, mixed-income housing that is physically and financially viable. In addition to rebuilding, Choice provides services to support residents in the target developments and the surrounding neighborhoods through programs focused on improving health, safety, employment, mobility, and education outcomes. Response rates for the target development sample ranged between 80 and 87 percent, and response rates for the Neighborhood sample ranged from 35 to 50 percent. The survey table (table A.1) describes the basic characteristics of respondents at each site, for those in the target housing developments and neighborhoods. Throughout this brief, survey estimates include two-tailed t-tests when we compare respondents of the target developments to those of the surrounding neighborhoods within each Choice Neighborhood. The comparison data come from the 2010 National Health Interview Survey (NHIS). We use nationally representative comparisons of black women in poverty from NHIS because respondents in three of the five Choice Neighborhoods (Chicago, New Orleans, and San Francisco) tend to be black women. The Seattle and Boston Choice Neighborhoods respondents are more diverse but are still majority black populations. Nonetheless, comparisons between these two target developments and national averages of black women have limitations. The Choice Neighborhoods baseline survey first asks respondents if they have chronic health problems. Only respondents who indicate they have a chronic health problem receive follow-up questions asking whether they have particular problems. Twenty percent of residents in the HOPE VI Panel Survey reported having asthma at baseline. In the Urban Institute’s Housing Opportunities and Services Together (HOST) demonstration, 26 percent of youth in Chicago’s Altgeld Gardens public housing community had asthma. Respondents were asked whether they had any of 11 housing problems: no running water, problems with toilets, water leaking from outside, water leaking from inside, exposed electrical wiring, holes in walls or floors, peeling paint or plaster, mice or rats, cockroaches, mildew or mold, and damaged windows or doors. Braveman, Paul, Mercedes Dekker, Susan Egerter, and Tabashir Sadegh-Nobari. 2011. Exploring the Social Determinants of Health: Housing and Health. Issue Brief No. 7. Princeton, NJ: Robert Wood Johnson Foundation. Brooks-Gunn, Jeanne, and Greg J. Duncan. 1997. “The Effects of Poverty on Children.” Future of Children 7 (2): 55–71. Ellen, Ingrid Gould, and Margery Austin Turner. 1997. “Does Neighborhood Matter? Assessing Recent Evidence.” Housing Policy Debate 8 (4): 833–66. Etzel, Ruth, and Ragnar Rylander. 1999. “Indoor Mold and Children’s Health.” Environmental Health Perspectives 107 (3): 463. Hailey, Chantal, and Priya Saxena. 2013. HOST: Helping Families, Building Community. Washington, DC: Urban Institute. Harris, Laura E., and Deborah Kaye. 2004. How Are HOPE VI Families Faring? Health. Washington, DC: Urban Institute. Hood, Ernie. 2005. “Dwelling Disparities: How Poor Housing Leads to Poor Health.” Environmental Health Perspectives 113 (5): A310–A317. Hooven, Carole, Paula S. Nurius, Patricia Logane-Greene, and Elaine A. Thompson. 2012. “Childhood Violence Exposure: Cumulative and Specific Effects on Adult Mental Health.” Journal of Family Practice 27 (6): 511–22. Jordan, Reed, Amanda Mireles, and Susan J. Popkin. 2013. HOST Youth: The Challenges of Growing Up in Low-Income Housing. Washington, DC: Urban Institute. Manjarrez, Carlos, Susan J. Popkin, and Elizabeth Guernsey. 2007. Poor Health: Adding Insult to Injury for HOPE VI Families. Washington, DC: Urban Institute. Maqbool, Nabihah, Janet Viveiros, and Mindy Ault. 2015. The Impacts of Affordable Housing on Health: A Research Summary. Washington, DC: Center for Housing Policy, National Housing Conference. Moonie, Sheniz, David Sterling, Larry Figgs, and Mario Castro. 2006. “Asthma Status and Severity Affects Missed School Days.” Journal of School Health 76 (1): 18–24. Popkin, Susan J., and Elizabeth Davies. 2013. Improving the Lives of Public Housing’s Most Vulnerable Families. Washington, DC: Urban Institute. Popkin, Susan J., and Liza Getsinger. 2010. “Tackling the Biggest Challenge: Intensive Case Management and CHA Residents’ Health.” Supporting Vulnerable Public Housing Families Brief 3. Washington, DC: Urban Institute. Popkin, Susan J., and Marla K. McDaniel. 2013. HOST: Can Public Housing Be a Platform for Change? Washington, DC: Urban Institute. Popkin, Susan J., Diane Levy, and Larry Buron. 2009. “Has HOPE VI Transformed Residents’ Lives? New Evidence from the HOPE VI Panel Study.” Housing Studies 24 (4): 477–502. Popkin, Susan J., Diane K. Levy, Larry Buron, Megan Gallagher, and David Price. 2010. “The CHA’s Plan for Transformation: How Have Residents Fared?” CHA Families and the Plan for Transformation Series. Washington, DC: Urban Institute. Popkin, Susan J., Diane K. Levy, Laura E. Harris, Jennifer Comey, Mary K. Cunningham, and Larry F. Buron. 2002. HOPE VI Panel Study: Baseline Report. Washington, DC: Urban Institute. Price, David, and Susan J. Popkin. 2010. The Health Crisis for CHA Families. Washington, DC: Urban Institute. Rauh, Virginia, Philip Landrigan, and Luz Claudio. 2008. “Housing and Health: Intersection of Poverty and Environmental Exposures.” Annals of New York Academy of Science 1136: 276–88. Robert Wood Johnson Foundation. 2008. “Where We Live Matters for Our Health: Neighborhoods and Health.” Princeton, NJ: Robert Wood Johnson Foundation. Sampson, Robert J., Jeffrey D. Morenoff, and Thomas Gannon-Rowley. 2002. “Assessing ‘Neighborhood Effects’: Social Processes and New Directions in Research.” Annual Review of Sociology 28:443–47. Scott, Molly, Susan J. Popkin, Marla McDaniel, Priya Saxena, and Reed Jordan. 2013. Serving HOST Families: The Challenges to Overcome. Washington, DC: Urban Institute. Smith, Jessica, and Carla Medalia. 2014. Health Insurance Coverage in the United States: 2013. Washington, DC: US Census Bureau. Solari, Claudia D., and Robert D. Mare. 2012. “Housing Crowding Effects on Children’s Wellbeing,” Social Science Research 41 (2): 464–76. Takaro, Tim K., James Krieger, Lin Song, Denise Sharify, and Nancy Beaudet, N. 2011. “The Breathe-Easy Home: The Impact of Asthma-Friendly Home Construction on Clinical Outcomes and Trigger Exposure.” American Journal of Public Health 101 (1): 55–62. Wodtke, Geoffrey T., David J. Harding, and Felix Elwert. 2011. “Neighborhood Effects in Temporal Perspective: The Impact of Long-term Exposure to Concentrated Disadvantage on High School Graduation.” American Sociological Review 76 (5): 713–73. Reed Jordan is a research associate in the Policy Advisory Group at the Urban Institute. He is currently managing the Housing Assistance Matters Initiative, a multiyear project to produce and publicize evidence-based commentaries about the effects of federally subsidized housing on people, communities, and the economy. Before joining the Policy Advisory Group, Jordan was part of Urban’s Metropolitan Housing and Communities Policy Center, where he worked on national and local-level projects related to affordable housing, community development, and performance management. The author would like to thank Paul Joice at the US Department of Housing and Urban Development, Office of Policy Development and Research and Urban Institute colleagues Rolf Pendall, Sue Popkin, Leah Hendey, Megan Gallagher, Alexandra Derian, and Jasmine Simington for their careful review and feedback on earlier drafts of this brief.